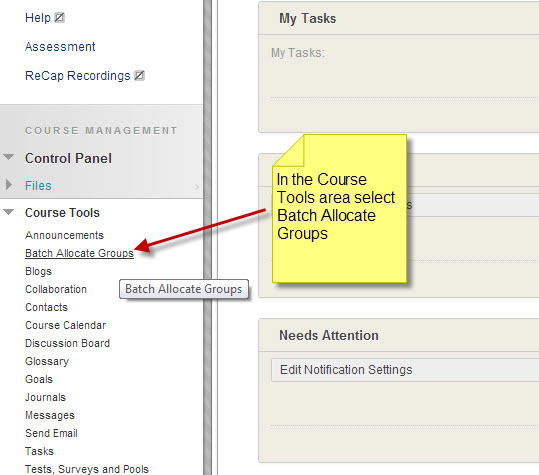 The Groups tool is a powerful feature within Blackboard that can be used in a variety of ways. For example to allow students to self enrol into a group or to allow you as the Instructor to create groups (manual enrol) based on specific characteristics. Once groups have been created you can tailor content or activities to them. The Blackboard help area gives a useful overview of the tool and the communication and collaboration tools that can be accessed by group members. Want to know which students are enrolled in specific groups? One of the recurring themes that came out of the Blackboard staff survey this summer was the requirement for staff to be able to view or extract from Blackboard a list of students and the groups that they were enrolled in. As a result of this NUIT have created a web page that allows you to easily view OR extract a list of students from a Blackboard module. To do this a member of staff needs to visit this web page and enter their module code, e.g. O1415-LAW1234. It is protected to staff use only and requires you to login to view it. Follow the on-screen prompts. Here is an example of how the view option appears, displaying the group names and student details. The exact student details and the module code have been intentionally obscured. Click on the image below to see a larger more detailed one. We hope this helps those of you that asked for this in the staff survey. The self enrol option allows students to sign-up or enrol themselves on to one or more groups. You may use this to allow students to sign up to meetings, seminars or any other scheduled event of your choosing. Look at page 2 of this PDF for a brief explanation of how to create the self enrol group. One useful tip – If you want a student to sign up to one group only you should create the groups using the GROUP SET feature. This means they can only enrol on one of the groups from this list. The manual enrol aspect of this means that the Instructor dictates what the membership of the group is and what tools are available to it (Email, file share, blog etc..). The Instructor can add or remove students from the group at anytime. An explanation of how to create a single manual enrol group can be viewed at the ondemand site created by Blackboard Inc.
To remove students from a group move them from the right hand box to the left hand one. See the image below, click on it to view larger size. If you wish to create multiple groups quickly, rather than going through the same steps many times, use the GROUP SET option. If you wish to populate lots of groups with students and have already created the Groups in your module, follow these three steps.